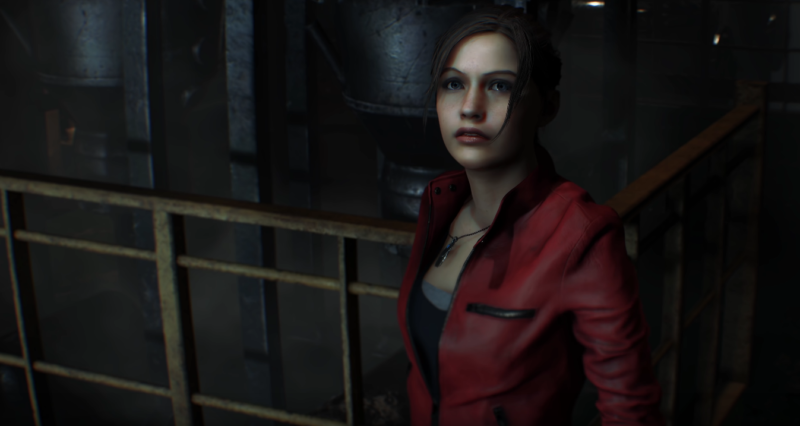 After many years of anticipation, Capcom finally revealed the Resident Evil 2 remake during Sony’s E3 2018 press conference. It was a bit of a surreal moment for me as a fan seeing a treasured game from my childhood remade for a modern platform, and I wasn’t the only one that felt that way. 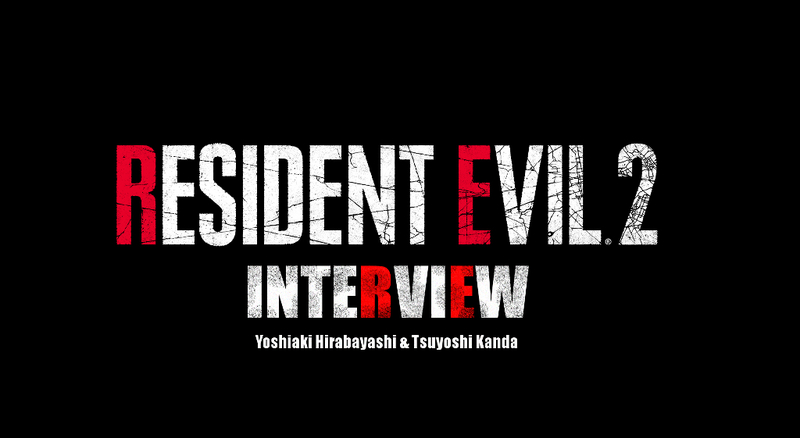 Capcom gave me the opportunity to interview producers Yoshiaki Hirabayashi and Tsuyoshi Kanda, and they had a surreal moment of their own during the reveal when they could finally show the world all the hard work they’ve put into this remake. I was more than a little excited to sit down with them and chat all about the project. Rely On Horror: Resident Evil 2 is not only arguably the most popular game in the series, but one of the most beloved games for the original PlayStation. Was there any apprehension in remaking it just based on how revered it is and the expectations that come with that fan adoration? 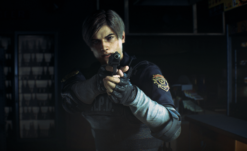 Yoshiaki Hirabayashi: We spent a lot of time talking about how we as RE2 fans ourselves on the team could take our memories of playing the game 20 years ago and we think we have that same perspective a lot of veteran fans do too. We really love this game, and our job is to respect the original whilst also bringing a sort of freshness to the reimagined version that lets not only veteran fans enjoy it but new players as well. But there certainly was a lot of pressure involved, lots of long debates and discussions with the team. Rely On Horror: How about the response to the reveal trailer, has the reception been pretty positive for you? Tsuyoshi Kanda: We were pleasantly surprised with how great and positive the reaction was. You mentioned the trailer opening with the first person perspective of a rat crawling around. This opening was a bit of strategic misdirection on our part, we wanted people watching the Sony conference to have some doubt as to what they were actually seeing. ‘What game could this possibly be?’ and then the hints begin to pile up ‘is this Resident Evil? Could it be? !’ then to have that moment where Leon appears and hear gasps and cheers from the audience as the trailer went on was really great for us. Rely On Horror: Are there any members of the development team that actually worked on the original Resident Evil 2? If so, do they offer any special input on the remake since they were there for the original game’s development? Yoshiaki Hirabayashi: Yes we have two artists on the team that worked on the original game, and in fact one of them even worked on the very first Resident Evil and has worked on multiple titles in the series. So they’re quite specialized and experienced, and they’ve been very valuable team members. Also, from a top down direction, our boss Jun Takeuchi is an old school Resident Evil 2 project manager. So we get a lot of advice/instruction from him. Tsuyoshi Kanda: Also on the sound team, Shusaku Uchiyama is working on the new title and he was there for the original game as well. Rely On Horror: Since Resident Evil 2‘s release, Resident Evil has had several action-heavy focused entries such as Resident Evil 4. From what I played of the demo this remake is a faithful and pure survival horror game. Was there any point in development where you considered making the remake more action focused? Tsuyoshi Kanda: I’m very pleased you got that impression from the demo, ’cause right from the start our goal was respecting the original’s horror atmosphere and gameplay. Resident Evil 4 and that sort of middle series of games had a more of an action/set piece focus where you’re always moving forward almost like a roller-coaster ride. That’s not what this title is, always from the start we wanted to keep it about exploration, backtracking, metroidvania style of gameplay with stages you can come and go in. You can of course use the latest technology to update that experience in lots of ways, but we never considered that this project would become an action game. Rely On Horror: The original game had 4 different scenarios with Leon A/Claire B and Claire A/Leon B. Will Leon and Claire’s scenarios mesh more into one overarching story this time around? Yoshiaki Hirabayashi: One of the great things about the original was this sort of two character system where you could get a different perspective on events. Either as Leon the rookie cop, or Claire as a student—the ‘zapping’ system as it was known where there was A parts and B parts to each character. We still want to replicate that feeling of seeing two sides to the same story through both character’s perspective in their own way. So for that reason we have a Leon campaign and a Claire campaign, they’re separate and you can choose which one you want to play first. We did simplify it a bit and make it more elegant by eliminating the A/B distinction and sort of meshing together what happens to the character’s A and B scenarios into one story. I think players today, they want these sort of deep/intense experiences with the story, and by stretching it across 4 scenarios the story gets spread a little thin and create a sense of repetition by going through the game multiple times to see everything. So for that reason we went with two campaigns that still show all the events of each character’s story rather than have it all split up. Rely On Horror: Will there be other camera angles/modes with an ability to switch between them? Follow up: were tank controls and fixed camera angles considered at all? Tsuyoshi Kanda: We’re really focused on our new over the shoulder camera, so we’re not really thinking about alternative camera options. 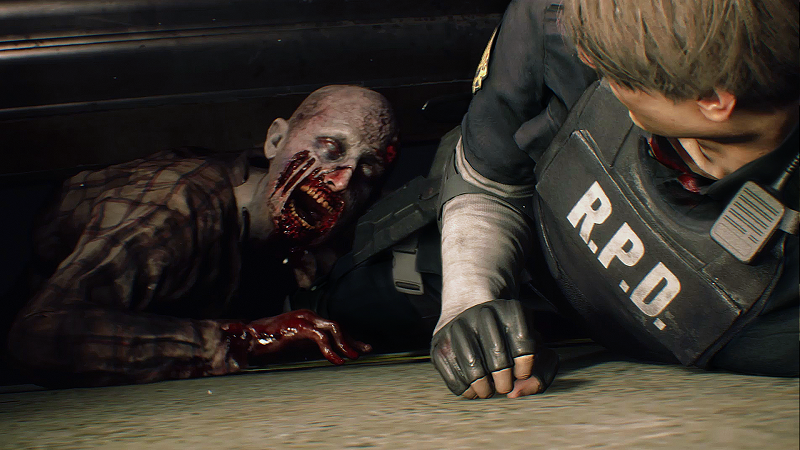 It’s not going to be a ‘shooter’ over the shoulder game, it’s going to be a tense claustrophobic camera that still really brings the horror experience even though it’s a new style for Resident Evil 2. Yoshiaki Hirabayashi: Looking at the series history so far as a sort of options on the table for what we could’ve done for a new game: we have the classic fixed camera, a third person camera, and even a first person camera with Resident Evil 7. So all of those are the sort of things we could’ve considered and they all have their pros and cons, none is a sort of clear winner for any particular game. But our concept was these up close and personal claustrophobic encounters with more terrifying than ever zombies, and I wanted to see the ‘biter’ and the ‘bitee’ on screen at the same time [Laughs]. With a first person camera, you see the zombie but not yourself; and with a fixed camera you see both but it’s more zoomed out and not as intense. For me the over the shoulder camera gives you that intense struggle between both the character and the enemy. 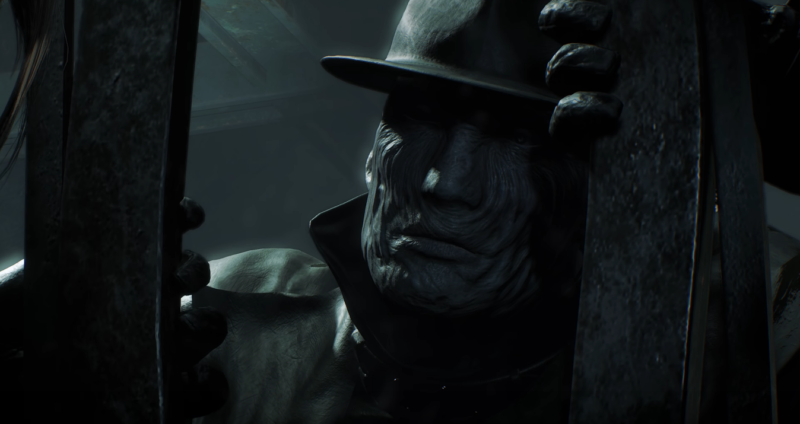 Rely On Horror: Resident Evil 2 has a lot of iconic enemies like Mr. X, William Birkin, and the Lickers. Did you have to update enemy mechanics to suit the OTS playstyle and combat? Tsuyoshi Kanda: Yes, we had to reconsider the space that the characters are in with the new camera angles. Taking the Licker for example, you first meet it in the ‘Licker corridor’ and while the CG movie plays it’s on the ceiling, then when it goes back to gameplay the Licker immediately drops down to the floor so you can aim down and shoot it. With that sort of camera the Licker can’t really jump around from different angles, but with the new over the shoulder perspective the Licker can move around a 3D environment and introduce 360 degree action. So the Licker will be much more able to utilize the entire space around you because you can see the entire corridor from any angle. It allows for much more elaborate and interesting enemy AI and behavior. Rely On Horror: How did they consider the fact that the game takes place in the ’90s and did they intentionally try to keep that aesthetic? Yoshiaki Hirabayashi: We’ve re-imagined the game but we aren’t rebooting it in the modern era, it’s still set in the same 1998ish period that the original came out in. So there needed to be care taken that objects in the game make sense for that time period. So even the music you might hear on the radio, we want to make sure none of it sounds modern or not of the era. Just before I left for E3 I was driving in my car and Nirvana came on, grunge was obviously very popular in the 90s and I was reminded how important it is to use objects or sounds to help establish a certain period of time. Rely On Horror: You have an Elza Walker costume. Are there other ideas from Resident Evil 1.5 making it in? Yoshiaki Hirabayashi: The digital deluxe edition does include an Elza Walker costume for Claire, which was a fun little touch to do because some fans might’ve seen Resident Evil 1.5 and wanted to experience bit of that. In general though, apart from that we haven’t included 1.5 stuff just because people don’t have memories of that or nostalgia for it. Rely On Horror: Resident Evil 2 is very special to a lot of people, myself included, do you have anything you’d like to say to all the fans that’ve been waiting many years to get their hands on this remake? Tsuyoshi Kanda: I really think that your readers and all the fans that’ve waited so long for Resident Evil 2 to be remade will love this reimagined version. Playing this beautiful looking new game whilst having your memories of the original flash back to you as you’re playing is quite special. We are fans too, and we’ve been really excited to bring this to you. It’s been a long time coming, so look forward to our updates between now and January and I really hope you all enjoy the game. Yoshiaki Hirabayashi: So we’ve kept you waiting, huh? Yes, I’m speaking as a producer right now, but my first game on PS1 was Resident Evil 2 as well. I know how much everyone loves it because I love it as well, and I’m also confident this is what you’ve been waiting for and you’re going to enjoy this new reimagined version. We extend our thanks to Hirabayashi-san and Kanda-san for their time. Keep a look out for my hands-on preview within the coming days!